Three people can be credited as inventors of packet-switched networks, thus laying foundations for Internet: Paul Baran, Leonard Kleinrock and Donald Davies. Paul A. Baran was born in the town of Grodno (then in Poland, now in Belarus) as Павел Баранов (Yiddish given name "Pesach", one of the most commonly observed Jewish holidays, usually in April) on April 29, 1926, as the youngest of three children in a Jewish family. In May, 1928, his family moved to the United States, first in Boston, then in Philadelphia, where his father—Morris "Moshe" Baran (1884–1979) owned a small grocery store. As a child, Baran delivered groceries for his father in his little red wagon. In 1949 Baran received his bachelor degree in electrical engineering from Drexel University in Philadelphia and immediately was hired by the Eckert-Mauchly Computer Company as a technician on the world's first commercial computer, the Univac. In 1950 he went to the Raymond Rosen Engineering Products Company, where he designed the first telemetering equipment for Cape Canaveral. In 1955 he married to Evelyn Murphy, moved to Los Angeles and joined the Hughes Aircraft Company, where he worked for 4 years, at the same time preparing his Master degree. In 1959 Baran obtained his Master degree in Engineering from UCLA and began working for the Research And Development (RAND) research organization in the same year. RAND was founded in Santa Monica, California, soon after the WWII to help maintain the unique system analysis and operations research skills developed by the US military to manage the unprecedented scale of planning and logistics during that global conflict. The US Air Force had recently established one of the first wide area computer networks for the SAGE radar defence system, and had an increasing interest in reliable and survivable, wide area communications networks, so they could reorganize and respond after a nuclear attack, diminishing the attractiveness of a first strike option by the main enemy—Soviet Union. 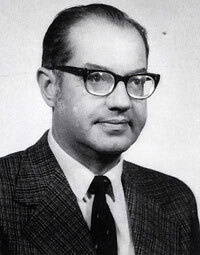 Relying on his experience in the radio-networks, Baran began an investigation into development of survivable communications networks, the results of which were first presented to the Air Force in the summer of 1961, and then he wrote a series of eleven comprehensive papers, which appeared in a series of RAND studies, published between 1960 and 1962, and then in a book, titled On Distributed Communications in 1964. Baran's study describes a remarkably detailed architecture for a distributed, survivable, packet switched communications network. 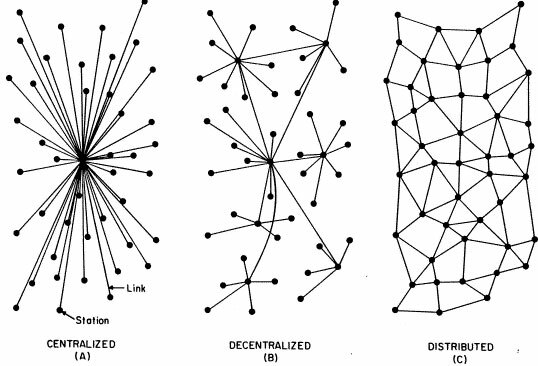 The network is designed to withstand almost any degree of destruction to individual components without loss of end-to-end communications. Since each computer could be connected to one or more other computers, Baran assumed that any link of the network could fail at any time, and the network therefore had no central control or administration (see the lower scheme). Using a mini-computer, Baran and his team developed simulation programs to test basic connectivity of an array of nodes with varying degrees of linking. That is, a network of n-ary degree of connectivity would have n links per node. The simulation randomly destroyed nodes and subsequently tested the percentage of nodes who remained connected. The result of the simulation revealed that networks where n>=3 had a significant increase in resilience against even as much as 50% node loss. Baran's conviction gained from the simulation was that redundancy was the key. Baran's work was accepted by the US Air Force for implementation and testing, but was neglected. His series of papers and book however then influenced Larry Roberts and Kleinrock to adopt the technology for development of the ARPANET network a few years later. Actually the ARPANET was never intended to be a survivable communications network, but some people still maintain the myth that it was. Instead, the resilience feature of a packet switched network, that uses link-state routing protocols is something we enjoy today in some part from the research done to develop a network that could survive a nuclear attack. While working at the RAND, in addition to his innovation in networking products, Baran also created the first metal detector, used today in all airports and many other security points. Paul Baran left RAND to become an entrepreneur and private investor in the early 1970's, and founded a couple of telecommunication companies—Metricom, Com21.com, and cofounded the Institute for the Future. Baran holds several patents and has received numerous professional honors, including the IEEE Alexander Graham Bell Medal, the Marconi International Fellowship Award and National Medal of Technology and Innovation. Paul Baran was a finest gentlemen and an extremely creative man. However, he believed that innovation was a "team process" and he didn't seek credit for himself. He once said: "Many of the things I thought possible would tend to sound like utter nonsense, or impractical depending on the generosity of spirit in those brought up in an earlier world." Paul Baran died of lung cancer on March 28, 2011, in Palo Alto, California. His wife, Evelyn, died in 2007. In addition to his son, David, of Atherton, California, he was survived by three grandchildren.